Phospholipids and triglycerides are important molecules found in biological systems. They are two of the three types of lipids found in nature. The other type of lipid is sterols. These types are different from each other according to their chemical structure. However, phospholipids and triglycerides are found in high amounts in our body whereas the amount of sterols present is very less. There is a slight difference between Phospholipids and triglycerides in their chemical structure. The main difference between the structures of phospholipid and triglycerides is that a phospholipid molecule is composed of a glycerol backbone attached to two fatty acids and a phosphate group whereas triglyceride is composed of three fatty acid groups. Phospholipid is a type of lipid composed of a phosphate group attached to a glycerol backbone. A phospholipid molecule is composed of a glycerol backbone attached to two fatty acid groups along with a phosphate group. 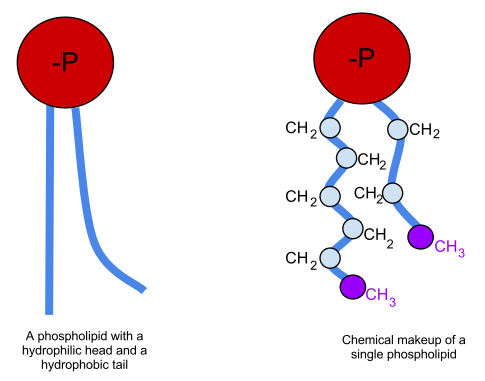 The structure of phospholipid is described as having a hydrophilic head and a hydrophobic tail. This is called the amphiphilic character of phospholipids. The hydrophilic head of the phospholipid molecule is composed of a phosphate group and a glycerol backbone. The hydrophobic tail of the phospholipid molecule is composed of two fatty acid chains. These fatty acid chains are long chain fatty acids. They repel water. Therefore, they are considered as hydrophobic part of the phospholipid molecule. Phospholipid is mainly found in the structure of cell membranes of organisms. It is in the form of a bilayer where two phospholipid layers are present. Here, the hydrophilic head forms the surface of the bilayer. The hydrophobic tails are in the middle of the bilayer. Phospholipids have very important functions. They are the major structural component of the cell membrane. Phospholipids help to keep the cell components inside the cytoplasm and regulate the exchange of some components in the cell with the surrounding. The sources of phospholipids include soya beans, rapeseed, chicken eggs, sunflower oil, etc. Phospholipids help oils to form colloids with water. Therefore, phospholipids are used as emulsifiers in food technology. Triglyceride is a type of lipid that is composed of a glycerol backbone attached to three fatty acid chains. The name triglyceride is given due to the presence of these three fatty acid chains. When considering the chemical structure of a triglyceride, it can be recognized as an ester compound. This is due to the presence of –COOC- bond. Here, a glycerol molecule reacts with three alcohol molecules in order to form a triglyceride. A glycerol molecule has three carboxylic groups. These carboxylic groups are attached to the three alcohol groups, releasing a water molecule per each bond. Therefore, three water molecules are released when a triglyceride is formed. Triglycerides are the major component of animal fat and vegetable fat. Therefore, it is called storage fat. Triglycerides can be found in saturated form or unsaturated form. This unsaturation is due to the presence of double bonds in the fatty acid molecules. The three fatty acid groups can be either identical or different. Therefore, according to the type of fatty acid present in the triglyceride, the properties are different from one triglyceride to another. Moreover, these triglycerides can be monounsaturated or polyunsaturated according to the number of double bonds present in the triglyceride. Since triglycerides are storage fat in our body, they can provide us with the energy we require when there isn’t enough calories in our body. Furthermore, triglycerides are helpful in absorption of certain nutrients that are fat-soluble. Both compounds are composed of a glycerol backbone. Both compounds are composed of fatty acid chains. Both compounds are types of lipids. Phospholipid: Phospholipid is a lipid composed of a phosphate group attached to a glycerol backbone. Triglyceride: Triglyceride is a lipid that is composed of a glycerol backbone attached to three fatty acid chains. Phospholipid: Phospholipids are composed of two fatty acid chains. Triglyceride: Triglycerides are composed of three fatty acid chains. Phospholipid: Phospholipids are composed of a phosphate group attached to the glycerol backbone. Triglyceride: Triglycerides has no phosphate groups attached to the glycerol backbone. Phospholipid: Phospholipids make up the cell membrane of cells. Triglyceride: Triglycerides act as the fat storage in our body. Phospholipid: In the formation of a phospholipid molecule, two water molecules are released as byproducts of each phospholipid molecule. Triglyceride: In the formation of a triglyceride molecule, three water molecules are released as byproducts of each triglyceride molecule. phospholipids and triglycerides are two types of lipid molecules. They are composed of a glycerol backbone attached to fatty acid chains. These fatty acid chains are long chains and are hydrophobic. 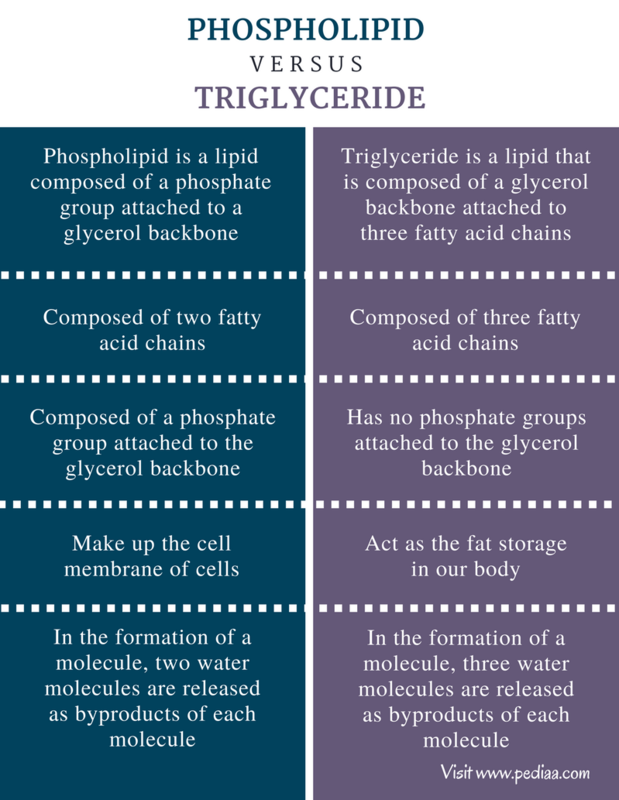 Although these molecules seem similar, there is a difference between phospholipids and triglycerides in their structure and function in our body. 1. Bailey, Regina. “How Do Phospholipids Help Hold a Cell Together?” ThoughtCo, Available here. Accessed 11 Sept. 2017. 2. “What is a Phospholipid? – Structure, Functions & Composition.” Study.com, Available here. Accessed 11 Sept. 2017. 3. “Triglyceride.” Wikipedia, Wikimedia Foundation, 2 Sept. 2017, Available here. Accessed 11 Sept. 2017.